In an effort to raise money for charity, we not only host athletic events, but also sell articles of clothing, including t-shirts and wristbands. T-shirts will be available for pickup during Fitness for Life specified events and scheduled times in the future. Manufactured by Hanes, these club t-shirts are 100% cotton and are available in both white and blue colors. They are tagless tees for ultimate neck comfort and made of ComfortSoft fabric for added comfort. They also feature shoulder-to-shoulder tape, double seamed neck, and are preshrunk to minimize shrinkage. T-shirt purchases count as "membership dues" in that they allow members to have certain benefits, including (1) priority in selecting time slots to attend schools, (2) a voice in the selection process of choosing lecture material, and (3) discounts to official Fitness for Life athletic events and tournaments. You can sport Fitness for Life wristbands by purchasing them at any of our events for only $1. 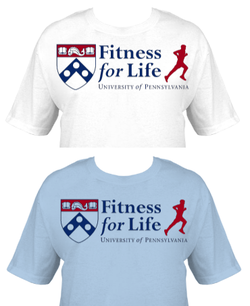 They are blue- and red- colored wristbands with the words "UPenn Fitness for Life" and the Penn shield embedded on them.